Happy New Year! We’ve finally arrived—it’s 2017 and the slate is clean, so it’s time to start mapping out some goals for the new year. The vast majority of families that I encounter say that after faith, family is the most important thing in their lives. If that’s the case, then it makes sense that this would be a good time for us all to focus on setting some goals to help take our family to new heights in the coming year. Most of you have probably used the maps app on your smart phone or used a GPS system in your car to figure out how to get where you want to go. You know the routine: you enter the destination you want, and the GPS figures out the best route for you to get there. But there is one critical piece that, if missing, would completely mess up the process: the GPS system needs to know where you are starting from. If you don’t know where you are starting from, how can you map the best route to where you want to go? The same is true for setting goals for your family. If you don’t have an understanding of where your family is right now, how can you get anywhere else? Mr. Zig Ziglar often referenced the Wheel of Life—which we’ve adapted as the Ziglar Wheel of Family Life—to use as a tool to check up on and get clear about where you are right now. This wheel has 7 spokes: physical, financial, relationships, communication, work-life integration, community, and faith. A weakness in any of these areas will bend the spoke and throw the wheel off balance, but it also gives you a great idea of exactly where you should start your journey. In other words, it will give you a starting point for your GPS to successfully navigate. For example, are your family relationships as strong as they could be? Are you connecting well as husband to wife? Parent to child? Child to child? When relationships are off, everything in the family is off. And how is your work-life integration right now? Do you find that you still have energy at the end of the day to give to your family? Or are work stresses leaving you depleted by 5:00 pm? As more of us work from home or in virtual workplaces, we sometimes find it even more challenging to create healthy boundaries between work life and family life. Zig Ziglar used to say, “Money is not the most important thing in life, but it is reasonably close to oxygen on the ‘gotta have it’ scale.” There’s a reason why money is one of the leading causes of divorce… is your financial life in order? Are you able to pay your bills each month without undue stress? In the next couple of weeks, I’ll be sharing some goal-setting strategies you can use this year to help your family reach its highest potential in all 7 of these areas. 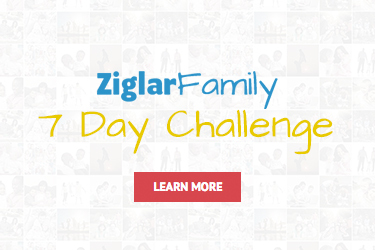 But first, I invite you to visit the Ziglar Wheel of Family Life page, and go ahead and take the free assessment as a first step in finding your family’s current location. It’s essential to know where to start so you can know where to go! And just remember: your current situation is not your final destination. The best is yet to come!